When staff enter Leave themselves this will automatically display on Timesheets as pending or approved. As best practice, staff should enter Leave themselves, you can send them this article to show them how to apply for Leave in Tanda to assist. On occasion though, you might need to enter Leave directly yourself, when you're approving Timesheets, in which case you can just enter it on the shift. At the bottom of this article we'll also explain some common issues with Leave and how to solve. The Add Leave Request box will pop up, again with the day automatically filled. Add the relevant details and click Submit. As above, the original shift will show above the Leave, but you can just click collapse if you don't want to see it. From here you can update the Leave or Decline/Delete the request. Can't apply a Leave type against an employee: this can happen in two scenarios - if you go to apply leave on a Timesheet and you can't select any leave types against the employee's name in the Type: drop-down box or you apply for leave under Time Off > Leave and you can't see the employee's name in the Select an employee drop-down. If you're missing a classification, click on the Name to edit the Leave Type and select the missing classification. Then go back into the Leave request and you should be able to select the employee. You can also check the employee's profile by going to Workforce > Staff > click on the employee's name > Payroll tab and check their classification. If they're not classified as a type that matches with the Leave, change this on their profile and save. As there's no Hours or Cost it won't export to your Payroll system and deduct from the employee's entitlements. 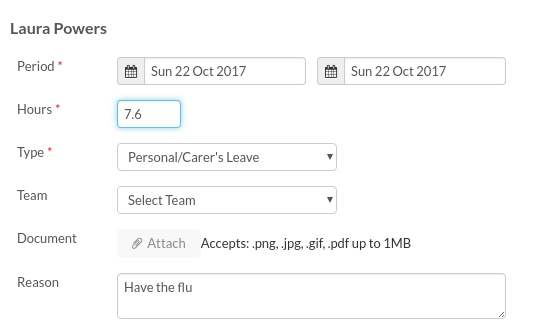 Leave showing Hours but no Cost: if the Leave request on the Timesheet has the amount of hours but no cost, there isn't a multiplier entered in the Leave setup. Go to Payroll > Leave Types > click on the leave to edit and then in the Pay Rate multiplier field, enter 1 or 1.175 if you include leave loading. For information on Public Holidays on Timesheets check out the following article.